Our Woodstock Director, Karen Geerts was in the news again. 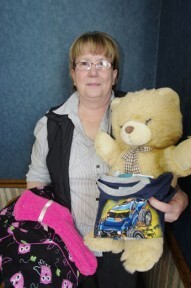 Power of HOPE’s “Pyjama Grandma”, Karen Geerts was featured in the January 20th, 2014 edition of the Woodstock Sentinel. Woodstock – Never underestimate the power of pennies, especially when it comes to comfy pyjamas at Christmas. The Power of Hope is looking for donations of leftover collections of pennies, and stores that will display change collection pots, to help them reach their goal of $2,500. “We are grateful for the support and generosity we have experienced over the last two years,” said director Karen Geerts.